WATER ACCESS to Haines Creek to EUSTIS Chain of Lakes. Impeccably maintained 3/2 split plan on close to half acre of easy to care for gardens and out buildings. This home has everything to please him or her. Great room with high ceilings and gas fireplace looking over the tropical backyard that is fully fenced and open to the kitchen. Her kitchen has been recently updated with granite countertops, newer gas 5 burner stove, new refrigerator and dishwasher and a 2015 microwave. Table/bar with granite top is moveable as well all looking through bay window. Both baths have been updated and are lovely! Master has access to large lanai and a walk in closet. Other two bedrooms have double closets and access to back porch. Garage is oversized with built ins plus you have 2 workshop/sheds in back yard. All new front windows, a well for irrigation, all new interior doors, roof is 2006, HVAC is 2018 what more could you want? 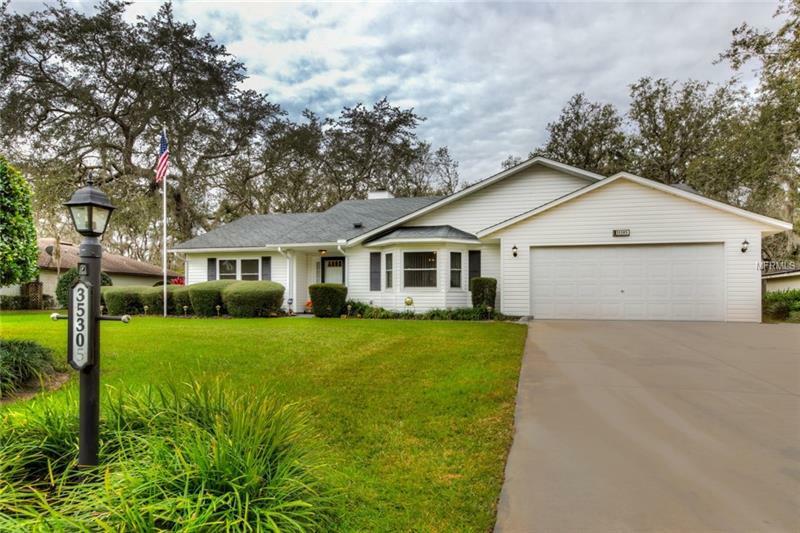 Riverside is close to shopping and Restaurants Mount Dora and the Villages, Hospitals and major Roads. You need to call your Realtor now! Additional Water Information: Riverside has boat parking, boat ramp, and slips on a first come basis.